One of our favorite places for photography in San Francisco is Embarcadero Center. The Center’s architecture is very special and unique – with lots of lovely nooks and crannies along with beautiful vistas of the four tall buildings that make up the core of the center. 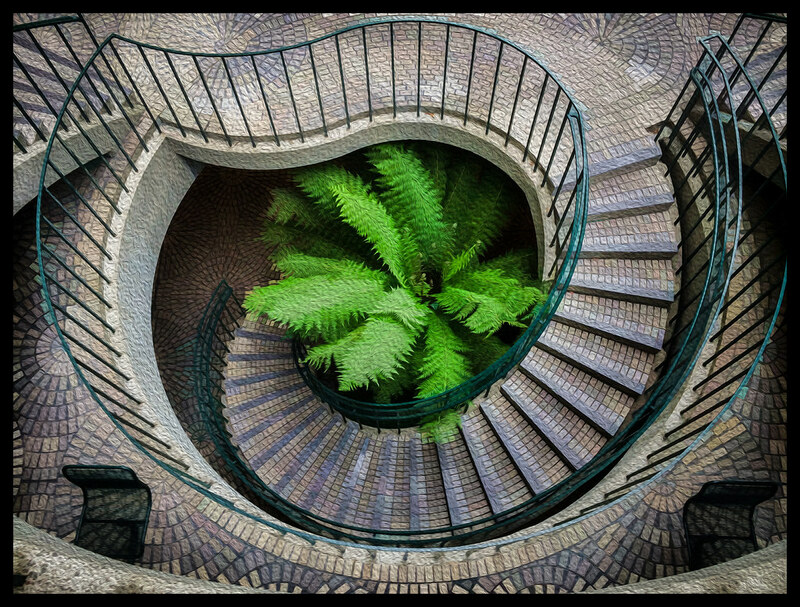 There are several spiral staircases within Embarcadero Center that make wonderful subjects for photographers. A couple outside and another couple inside the buildings. As the light shifts, the outdoor ones take on a variety of moods – sometimes they’re in bright light/shadow. Other times, when it’s foggy and overcast, there’s a soft light aspect that can be special. Yesterday, we were on our way to see the movie Tim’s Vermeer at the Embarcadero Center Cinema when I walked by this particular staircase and captured it with my iPhone 5s. I brought it into Photoshop CC and tweaked it a bit using both Topaz Simplify 4 and the Oil Paint filter to add a bit of interesting texture. The image deserves more time to make it even better – but this quick, first cut version captured my eye!